Join Chorus Voices Podcast hosts Louise Forster and Dan Minchin as they explore how gardening has taken root in the Chorus community. If you’d like to join our garden volunteers, check out gardening program details here. 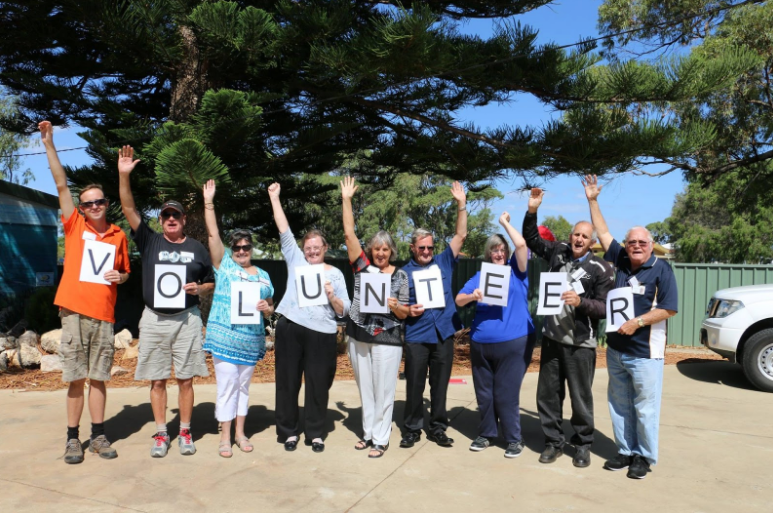 Volunteers operate from five depots – Carlisle, North Perth, Wanneroo, Safety Bay and Midland – so you’re never far from an opportunity to dig in! Gardening isn’t just a service Chorus provides. Chorus has entered the Perth Garden Festival for the past two years, even winning best in show last year! Dan and Louise are chuffed. Last year’s award-winning Chorus garden. The name of the this year’s Chorus garden is Kaleidoscope, based on the name of a group of butterflies. 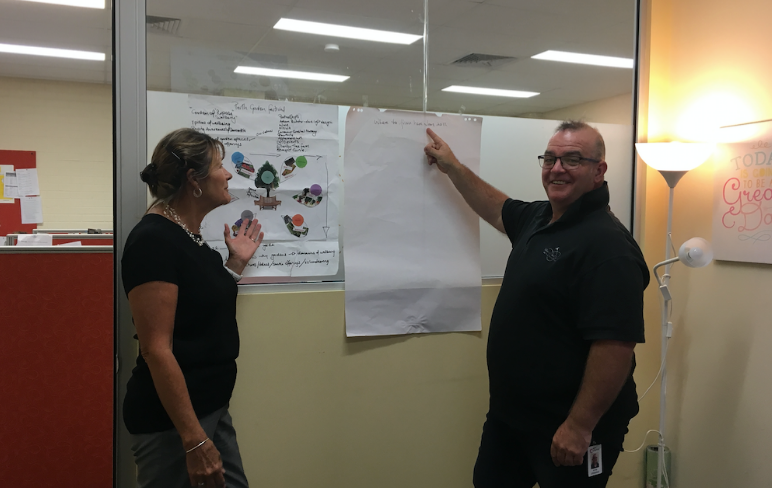 The theme will revolve around the seven dimensions of well-being, dementia – and butterflies! People with dementia have far greater quality of life when all of their senses are engaged. The design of the garden will represent those senses, and draw the connection back to people living with dementia. 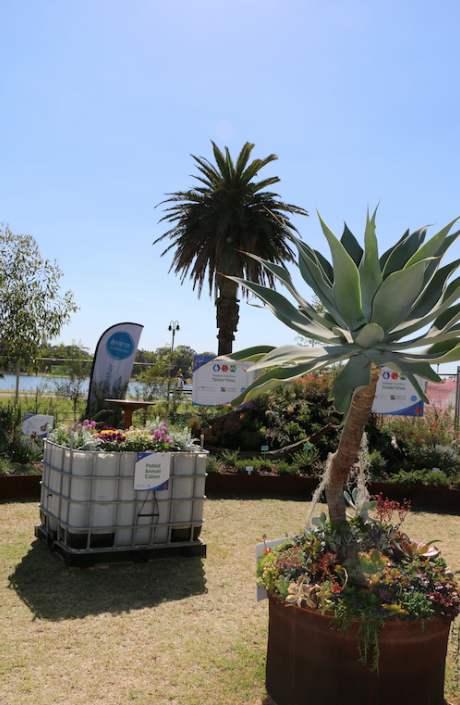 The Perth Garden Festival will showcase Chorus to the local community, sending a powerful series of messages about Chorus values, and the work they’re doing. We hear from Andy, a lead gardener at Chorus about his feelings and opinions on the project. Andy comments about the dementia theme. There are many people out there living with dementia. The stories of people living with dementia and their families should be shared, and those touched by dementia must know they’re not alone, and are welcome to share their experience. The garden project will help achieve this. What’s more, this garden can raise awareness for those who may experience dementia in the future. Not all who see the garden may have experienced dementia, but they’ll be better prepared to gracefully handle the challenges should they arise. Garden plans are underway! Andy holds one of the decorations as he and Tina plot how to make the project both beautiful and meaningful. Gardening has spread its roots wider within the Chorus organisation as well. Andy suggested that another group, the Ability Arts team, be invited to help out with gardening. Louise jumped at the idea – and so did the Ability Arts team. We hear now from Elli from Ability Arts. Elli comments on what a positive experience gardening can be for Ability Arts. Hosts Louise and Dan have always looked at gardening as rather a chore. We’re sure they’re not alone. And it’s true – gardening is hard work! But a lot of joy comes from it as well. Rewards come from the gardening itself, and the lives of the people who get to work on and interact with the garden. A volunteer named Andy (not the Andy we spoke with earlier) has been gardening with Chorus for some years. He’s living with dementia. Through the support of the Chorus team, he’s been able to contribute to gardening work, which has been deeply meaningful for both Andy and his wife Jackie. Dan spoke to Andy and Jackie recently. Andy reminisced about the long period when he didn’t know he had dementia. He couldn’t work out what was going on for some time, and was having trouble getting regular work. So he fronted up to Chorus (Volunteer Task Force at the time) and asked if he could join as a volunteer. He was welcomed with open arms, and gardening has been a bright part of his life ever since. Come Check out Our Garden at the Festival! Come see The Chorus Kaleidoscope garden from 12 – 15 April at the Perth Garden Festival. We’d love to show you the work we’ve done on our garden and the work we do with communities. It goes without saying that the experience will carry special significance for those whose lives have been touched by dementia. Make sure to stay tuned for the upcoming episodes of the Chorus Voices Podcast! We haven’t even scratched the surface when it comes to the vital themes and ideas that matter in work, in life, and in the communities that contain them both.